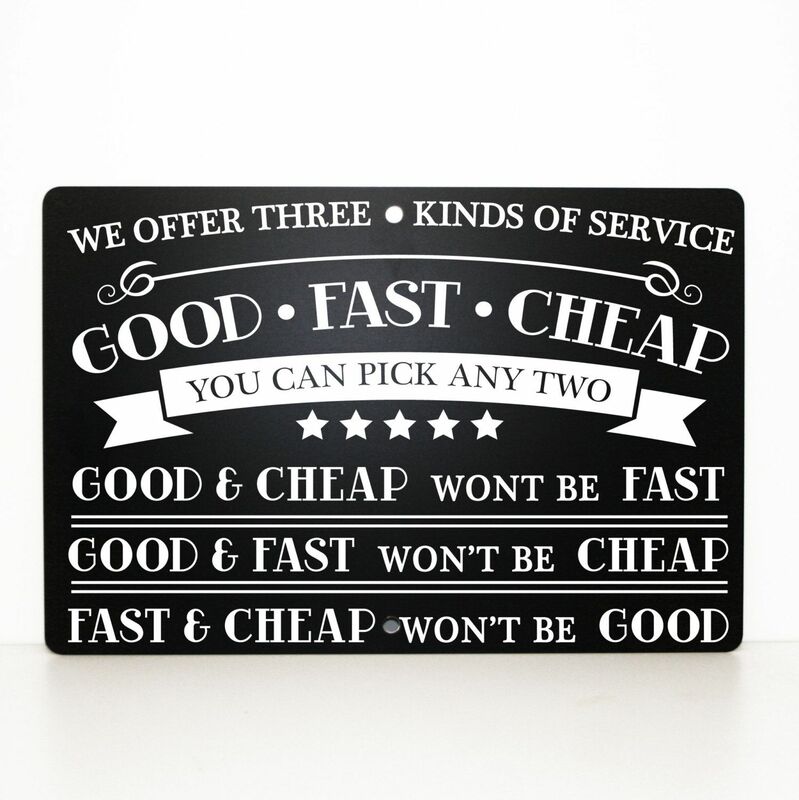 Good, Fast, Cheap: Pick any Two – is a common business Axiom that’s been around for ages. While you won’t find this in any Business Administration textbooks, all Business Owners – and most Consumers know this pithy saying has its’ roots in truth. You Get What You Pay For and There’s No Free Lunch are Maxims centered around the same idea; there is a constant tension between quality, price, and speed-of-delivery for most – if not all products. Marketers – especially those in the Automotive Industry – would have you believe that you can Have It All; the lowest price, exceptional quality, and immediate delivery. Just watch the latest new truck commercials; competition is fierce and overblown promises abound. Good: Speaks to the quality of the product or service. Most people automatically assume this means The Best, but it’s seldom the case that The Best is required to get the job done. In IT systems, it means we choose just enough power, capacity, and reliability to get the job done for 5 years. At the end of 5 years, most IT systems are obsolete and need to be replaced. Good really means Good Enough. Anything more is a waste – as the Client will never see the benefit. Fast: Determines how fast a new system can be implemented. There is an assumption that vast warehouses are loaded with IT products waiting for delivery – and they are. But there are also hundreds of thousands of parts; some with slight but important variations. Given that a typical installation might have 200 or more individual parts, it’s easy to see that sourcing the correct parts can be a challenge if the delivery timeline is short. Cheap: This seems obvious; a lower price is always better. However, it might not be that simple. Unlike buying a new truck, product knock-offs are common in the Computer Industry – as are some outright bogus products; especially in software. We’ve run across some very sketchy Suppliers, where the deal seemed too good to be true; and it was. They disappear after a few months only to resurface under a different name. We ignore them and rely on a handful of reputable Suppliers with solid business credentials. However, they’re not always the cheapest. Software licensing is another common way to cut corners. Even if you avoid the outright bogus Suppliers, the licensing requirements for software – especially Microsoft – is convoluted, and it’s tough to get it correct. We’ve performed several reviews of server-based user licensing for Clients and almost all of it is deficient in some form. Correct software licensing can add hundreds or thousands to the cost of a project. Case #1: We had a Client who recently lost their primary facility due to an unforeseen circumstance. They needed to recover their operations as quickly as possible; about 20 workstations and a complete multi-server infrastructure. In other words, they needed Good and Fast. It meant we had to sacrifice Cheap. From our 4 major Suppliers, we chose products based on ready availability; some desired products came from warehouses that were more expensive and some products had to be over-provisioned, because they were in stock. We used expedited delivery services and we had to divert Techs from other projects and have them work extended hours to complete the job. The Result: the Client was up and running within a week – Good and Fast, but not Cheap. Case #2: We had a prospective Client contact us to provide a complete IT system for a new facility that was due to open in about a month; again, it was a multi-server environment with about 20 workstations. Our marching orders were Good and Fast; in fact the Client specified The Best. Like Case #1, we sourced products from a variety of Suppliers – opting for the high-end with plenty of redundancy and capacity. With a very limited selection of suitable products to choose from, we knew that meeting the delivery schedule would be almost impossible. So we made a commitment to the Client that we’d install temporary loaner equipment to meet the opening date, and then follow up with the correct product when it arrived; essentially performing the installation twice. We configured our solution to be the Best and Fast. The result: we lost the job to another contractor who was Cheap. We reviewed our proposal and are convinced we hit the mark, we think the Client might have got Fast and Cheap. Case #3: We had a Client who was expanding their operations by taking over a similar organization in another location. They wanted the IT systems of the new location to match their existing main-office infrastructure. There was plenty of advance notice, as the take-over was planned in 2 stages spanning several months. We were able to perform a thorough investigation of the new office infrastructure, identify which products needed replacing, meet with the Client to discuss options, and finally order the upgrades from Suppliers who gave the best price. The result: Installation is proceeding according to plan and the offices will be fully integrated in early 2019. The Client got Good and Cheap. We’ve seen the tension of Good – Fast – Cheap played out countless times in the course of our 20-year history. With rare exceptions, the Axiom remains true. Which brings me to my central point: of the three, sacrificing Fast always produces the best stress-free IT. With a typical IT system life-span of 5 years, making compromises to be Fast inevitably leads to disappointment, because the overall system-value is lower; either Good was compromised or it wasn’t Cheap. The Client could be stuck with this compromise for 5 years. We’re approaching the season when many of our Clients are budget-planning for 2019. We’ve always thought this was a great idea for all of our Clients, not just those who are forced to develop budgets. It’s a chance to review the current capacity and performance of critical systems and proactively plan for future enhancements – and it’s a Consulting Service we provide to our Clients for Free. Budget Planning avoids last-minute reactive decisions that can lead to Fast being the driving force behind IT system enhancements. If you would like to learn more about IT Budget Planning, please contact me or your Account Manager. It’s time to sacrifice Fast for some stress-free IT.